In May (2017) a delegation of the project “Development of cyber-physical social systems based on the Internet of Things for the factory of the future” (DiFiCIL), contract No.69/08.09.2016, paid a visit to Biel/Biene-Switzerland with the aim of concluding an institutional collaboration partnership. 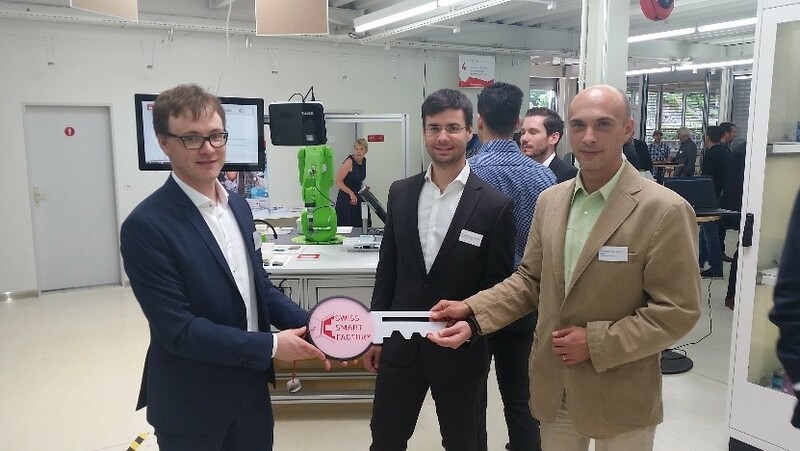 The two representative persons from the project, associate professor Bogdan-Constantin Pîrvu and professor Constantin-Băla Zamfirescu were welcomed by Dominic Gorecky, the research director of Swiss Smart Factory. During the meeting, discussions were focused on the interconnection of the production infrastructure of DiFiCIL (Sibiu) with Swiss Smart Factory systems (Biel), to exemplify the joint design and partnering on building customizable products. The visit from Switzerland was the starting point for the signing of an Erasmus + agreement, which will facilitate the collaboration between the researchers from “Lucian Blaga” University of Sibiu with the Swiss Smart Factory through the Fachhochschule Biel. Also, the signing of the institutional collaboration protocol between “Lucian Blaga” University of Sibiu and Swiss Smart Factory represents an opportunity in the realization of possible projects for the next period. Collaboration involves the exchange of information, participation in seminars, colloquia and symposiums, as well as access to academic materials and equipment. The two institutions have the opportunity to jointly carry out research projects or other collaborative activities of common interest. The agreement has an initial five-year collaboration period.